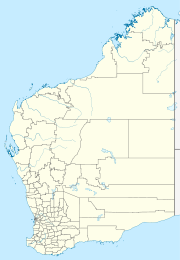 Eradu is a small town in Western Australia located in the Mid West region of Western Australia 34 kilometres (21 mi) east of Geraldton on the Geraldton–Mount Magnet Road. Following the opening of the Nangulu-Mullewa railway line in 1894 a station was opened at the location of the current town-site. The name of the station was Greenough River until 1903. It remained a station with a station master from 1915 to 1921 and was gazetted as a town in 1920. The station later became a siding until it was closed in 1973. The name is Aboriginal in origin and is the name of a pool found in the nearby Greenough River. ^ Western Australian Land Information Authority. "History of country town names – E". Retrieved 4 February 2011. This page was last edited on 29 December 2018, at 05:34 (UTC).